Dr. Ross Clevens hosted multiple hot-topic presentations at the second-annual Global Aesthetics Meeting in November. 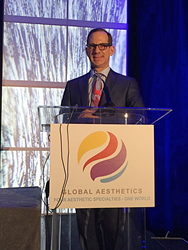 Ross A. Clevens, MD, FACS was invited to deliver multiple presentations to other facial plastic surgeons from around the world at the much-anticipated Global Aesthetics meeting this month. The conference, held at Loews Miami Beach from November 2-4, included leading plastic surgeons and aesthetic professionals from around the world. This is the second consecutive year Dr. Clevens has been asked to be a presenter at the Global Aesthetics Conference. The only multispecialty, international aesthetic meeting in the world, the Global Aesthetics conference brings together an international group of specialists for a three-day learning event, designed to build educational cooperation between the different core specialists. Industry leaders from all aesthetic specialties attend, including facial plastic surgery, plastic surgery, dermatology, oculoplastic surgery and allied health care providers. The 2017 Global Aesthetics meeting was designed to touch on the hottest topics of aesthetic medicine, including sessions on breast and body surgery, fillers and toxins, facial plastic surgery, and vaginal rejuvenation. Dr. Clevens is the founder of Melbourne’s Clevens Face and Body Specialists, growing his practice into the top plastic and cosmetic surgery provider in Florida. Dr. Clevens is an Ivy League trained physician, completing his undergraduate degree at Yale University, followed by medical school and a competitive internship at Harvard University and advanced training at the University of Michigan. A double board certified facial plastic and reconstructive surgeon, Dr. Clevens is widely known for his meticulous attention to detail and artistic sense of balance and anatomical harmony. An avid researcher, writer, and speaker, Dr. Clevens routinely speaks at aesthetic meetings around the world. For more information, please contact Clevens Face and Body Specialists at 321.727.3223 or visit http://www.drclevens.com. 707 W. Eau Gallie Blvd.